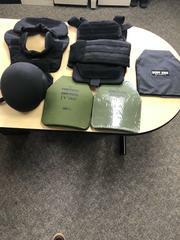 Subject on Probation arrested for Robbery and Domestic Violence while in possession of body armor. On 3/19/19 SRPD officers were dispatched to a domestic violence investigation. During that investigation, officers discovered Gerald Michael Perez, a 32-year-old Santa Rosa resident, had been involved in an altercation with his girlfriend. Based on their investigation officers believed Perez had committed misdemeanor domestic battery, robbery, and had violated the terms of his probation. Perez was on felony probation at the time of this incident for assault with a deadly weapon. Perez was not located at the time of the initial investigation and a Be on the Lookout was given to officer’s county wide. On 3/20/19 Detectives from the Santa Rosa Gang Crimes Team located a vehicle that Perez was known to drive. Perez was observed driving the vehicle and was ultimately stopped by uniformed patrol officers and arrested without incident. During a search of the vehicle that Perez was driving, officers located body armor (rifle plates) and a ballistic helmet. Due to Perez’s prior felony convictions, he is prohibited from possessing body armor. The Santa Rosa Police Department is committed to reducing violence in our city. We encourage anyone who witnesses criminal activity to immediately call and report the activity to the police department at (707) 528-5222. Completely confidential and anonymous messages about gang activity can be left at 707-543-GANG (4264).